Champaign Biscuits Take 8 ozs of Butter. 8 ozs of loaf sugar 10 ozs of flour, warmed and put through a seive, 5 Eggs put the yolks to the Butter first beat to a cream, beat it with a wooden spoon for 20 minnets, then put the sugar, in and mix it well, you must whisk up the whites to a strong froth then put in a little flour and a little white of Egg till it is all in put two tablespoonsfuls of Brandy in, then divide it and put currants in one half and carraway in the other then put them in the tins to Bake the oven must not be very hot you may drop them on paper with a teaspoon or in the halfmoon tins you must rub the tins with butter before you drop them in 15 or 20 minuets will bake them but there is as much in baking them as making them you must only put 3 in the half moon tins with a teaspoon halffull. Red Currant Jelly - Mrs [Gabson?] 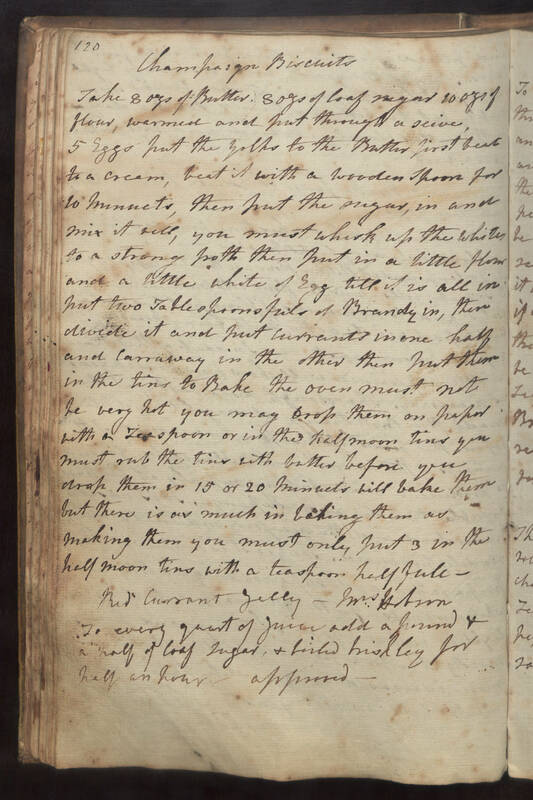 To every quart of juice add a pound & a half of loaf sugar, & boiled briskly for half an hour. approved.